New home buyers don't want a used house when only new home construction will do. They don't want to inherit somebody else's worn carpeting, personal taste in kitchen appliances, or look at some kid's initials scrawled into once-wet cement. The home must be brand spankin' new, fresh and clean without so much as a finger print on the walls. If this describes you, and you have always fantasized about buying a brand new home of your dreams, here are a few tips that can help you to protect yourself—to make the process a pleasant experience. Many builders will not allow you to hire your own agent if you wander into the new homes sales office without representation. If you visit a builder's home construction site without an agent, you might be hosed, because later the builder could refuse to pay your agent. Let your agent introduce you to the builder, and you're covered. The builder's sales agents are paid to represent the builder, regardless of what they may tell you. Many will use high pressure tactics to persuade you to sign the contract. Due to the high volume nature of brand new home sales, lots of builder's agents are paid less than a traditional commission; some earn a salary plus incentives, so turnover is important to their livelihood. Hire a buyer's agent to represent you. Most of the time, your agent will be paid by the builder, but sometimes the responsibility for the agent's fee is open for discussion. Builders generally advertise how much they will pay a buyer's agent. Rarely do they refuse, unless inventory is low and demand high. Even if you have to directly pay your agent, you can probably add that fee to the sales price, and it would be worth it because a good negotiating buyer's agent can save you thousands more than the commission. Your own agent will represent you and be your fiduciary, and he or she is required to disclose the positives as well as the negatives about the transaction. Builder's agents don't discuss drawbacks. Your own realtor is required to put your interests first. If your contract contains a contingency to sell your existing home before buying, hire your own listing agent to list your home. 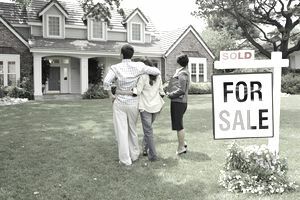 Be aware that buying before selling is not always in your best interest, because hard bargaining often goes out the window when you've emotionally moved out of your home. Builders often prefer their own lender because the builder will be kept fully informed of your personal progress; it's one-stop shopping for a builder. But a builder's lender might not offer you the best deal. Moreover, the builder may own the lending company. Ask if there is an incentive to use the builder's lender. Sometimes you will get a break. Consider alternate sources to find a lender. Your own bank or credit union might offer you very attractive rates and terms, based on your banking history with that institution. Your agent may refer you to his or her private list of wholesale lenders. Shop around and interview your lender. Find a banker or mortgage broker you can trust and with whom you feel comfortable doing business. It's not always about the rates, as most people's rates are about the same. Ask to see a copy of your credit report and FICO scores. You can order your own free credit report before shopping for a new home. Expect your lender to guarantee its fees. The lender is required by law to issue a loan estimate disclosing all of the closing costs. Before you sign a purchase contract, you might want to talk to a real estate lawyer. Standard purchase agreements are designed to keep everybody out of court, but they don't necessarily contain language that protects the buyer. The laws in your state may require the involvement of a real estate lawyer. Ask questions about removal of contingencies and your cancellation rights. Make sure you understand your liability and commitments. Find out if the materials used by the builder contain chemicals that are hazardous to your health. If your contract contains a warning about health issues, it's probably because this is a valid concern and other buyers have gone to court over it. Determine which options and upgrades you want. Bear in mind that for many builders, the profit margin is highest in upgrades. Some builders can sell a home for almost bare construction cost because they make the bulk of their profit in the upgrades. Find out whether your lender will lend on all the options/upgrades you have chosen. If your lender will not finance 100% of your selections, you will be required to pay for it in cash. Ask about cancellations and whether you will be held liable for items the builder cannot return to a vendor. Some contracts give the builder the right to choose your upgrades if you do not submit your request within a certain period of time. To save money, consider which upgrades you could purchase and install yourself after the escrow closes. However, realize that some upgrades such as CAT-V ethernet, DSS satellite, or security wiring inside the walls are easier to do before construction. If a buyer has a bad experience with a builder, the word spreads rapidly throughout a community. But you won't know if a bad rep is an isolated experience or if the builder repeatedly brings bad publicity to itself without checking and verifying the public records for lawsuits. Talk to the neighbors and scrutinize the construction quality of surrounding homes. Is the builder consistently building identical or larger homes in the area or is construction lagging and homes shrinking in size? Find out whether the builder sells to investors. Some builders require all their homes to be owner occupied. Others eagerly sell as much inventory to investors as profit margins will allow. If the market suddenly dips, investors are typically the first to bail and, besides, part of the reason you are buying in a new subdivision is to be surrounded by other buyers just like you, not tenants. If the inspector calls for further inspection by another professional contractor, find out if the inspector is telling you there could be a serious issue or if the inspector isn't licensed to address that issue.